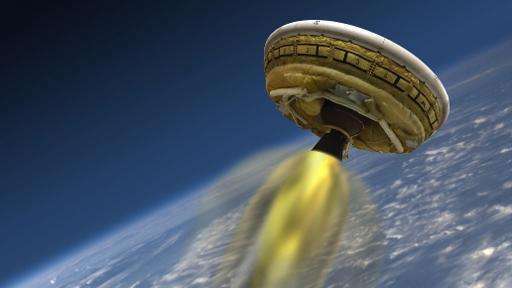 The test flight of the flying saucer, known as the Low-Density Supersonic Decelerator, will be broadcast live on NASA's website beginning at 1:30 pm (1730 GMT). The US space agency figured out how to do this decades ago, beginning with the Viking mission which put two landers on Mars in 1976. But with the goal of sending humans to Mars in the 2030s, the agency is now testing a more advanced, new generation of parachute technology, known as the Supersonic Ringsail Parachute, that could allow even heavier spacecraft—the kind that may have humans and months of food and supplies on board—to land softly. The test vehicle weighs 6,808 pounds (3,088 kilograms), or about twice the weight of the kind of robotic rover spacecraft NASA is currently capable of landing safely on Mars. The parachute, described by NASA JPL as "the largest parachute ever deployed," is 100 feet (30 meters) in diameter. The goal is for the chute to "slow the entry vehicle from Mach 2 to subsonic speeds," NASA said. 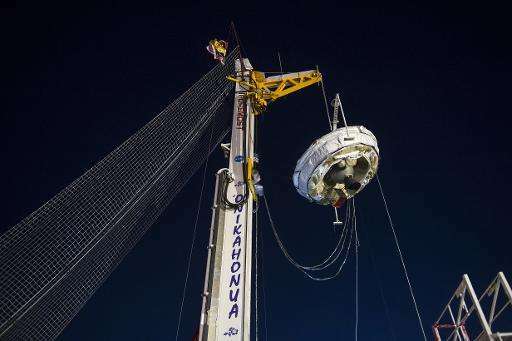 The test will involve sending the saucer, an inner-tube shaped decelerator and parachute to an altitude of 120,000 feet (37 kilometers) over the Pacific Ocean with the help of a giant balloon. The balloon will release the spacecraft and rockets will lift the vehicle even higher, to 180,000 feet (55 kilometers), reaching supersonic speeds. The first test flight of the flying saucer was in June 2014, and another test flight is planned in 2016. A different kind of parachute known as the Supersonic Disksail was tested in the 2014 flight but it did not inflate as hoped, and shredded to pieces at the high speed and altitude. NASA said researchers have since "gained significant insight into the fundamental physics of parachute inflation," and the team "has been re-writing the book on high speed parachute operations" since last year, the agency said.